I am forever singing my praises about GHDs to my friends and family – and regularly reviewing their latest models right here on Hair Companion. Their hair straighteners are second-to-none in many categories, and I use their products on a daily basis to style my hair and give me a beauty boost. One thing I had yet to try, however, was the GHD Air. Hair straighteners and tongs are my forte, but I’ve yet to invest in an expensive hairdryer. For one, I didn’t think they would be able to top my £20 BaByliss 5541CU Pro Speed hair dryer, and I also didn’t see the value of spending hundreds of pounds to perform a basic beauty function – after all, there’s only so many ways to dry your hair. But how wrong I was. After spending a couple of weeks playing around with the GHD Air hairdryer and fully incorporating the hair care tool into my daily regime, I’m here to give you my review. What’s the deal with the GHD Air hairdryer? GHD claim that the body of this hairdryer was designed to give you a faster blow-dry, and, although I was sceptical, it was clear that this model was designed with power in mind. I can dry my entire head of hair in just a couple of minutes, and it doesn’t feel over dried or overworked when I do so. I really wanted to find a way to reduce the amount of time I spend straightening my hair, as, although it’s certainly one of my hobbies, I am worried about the damage it can do. This dryer was designed to offer an “effortless salon finish every time” – and I do feel like it lives up to that. On several occasions, my hair has looked so good after drying that I haven’t had to go on to straighten it, which is unheard of for me. For this reason alone, I recommend this hairdryer. You could probably call me a little bit of a technophobe, but even I can understand the power of the GHD Air hairdryer. Described as offering “professional strength”, this hair dryer really does make you feel as though you’re spending time in the salon. It has a 2,100 Watt AC motor at 240v, more powerful than many of its competitors. It features advanced ionic technology to give you safe and comfortable drying performance, and comes with variable power and temperature controls – including a cool shot. If you’re anything like me, you’ll really enjoy this feature – it allows you to inject some cool air into your hair if you’re feeling too hot during the styling process – a feature particularly useful during the summer months. 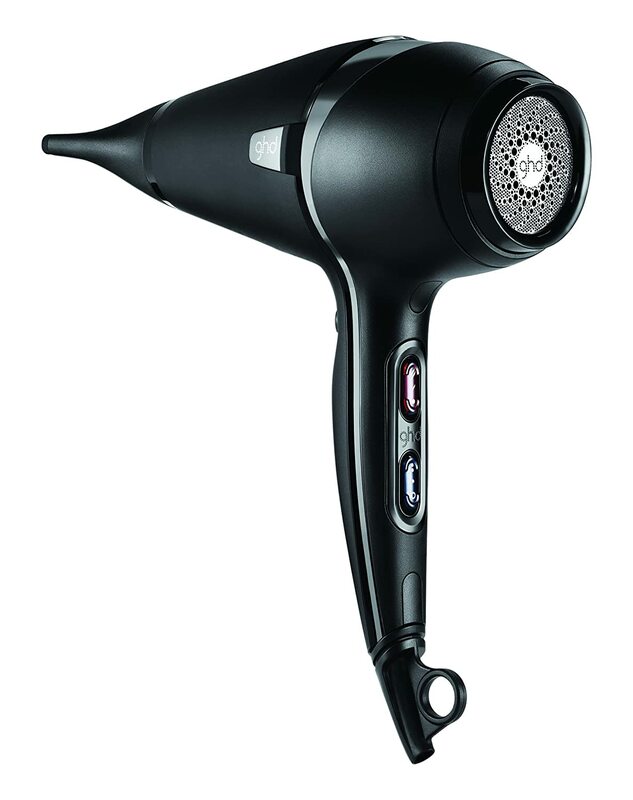 The model features an ergonomic design for both right and left-handed users, which is particularly useful if you’re sharing your hairdryer with friends or using it in your salon. I found that this model was really comfortable to hold – even during extended styling periods. The dryer also offers a three-meter power cable, which is really handy when you’re spending time on your feet perfecting your style. My dressing table is packed with plugs and cables, so the extended cable on this dryer gives me more flexibility and control over where I choose to style. One of the best things about this model is the fact you don’t just get the hairdryer in your package. I was surprised to see the array of accessories included with my dryer – accessories that are usually charged as optional extras. The wide nozzle is ideal for styling, while the two sectioning clips can be used for both drying and styling with my GHD straighteners. The diffuser is another tool that I’ve been using during styling – with thick, long hair, this accessory allows me to control my frizz and help me get a perfect style every time. Also included is a soft protection cover, which is great for storing your hairdryer if you’re planning on taking it away with you, and a vented radial brush – an accessory that’s worth at least £25 when purchased on its own. I’ve always been happy to sing my praises for GHD and this hairdryer only cements the brand as my favourite in hair care. It’s a reliable, professional and lightweight hairdryer that I’ll continue to use, and can transform my hair from wet, wavy and lifeless to salon-finish in just a couple of minutes.